So another day has passed and the website is almost up. There really is just one more thing to do. How exciting! I’ll be sure update this blog when I have the go ahead from my web guy. I realize I have been talking a lot about the site and not much about the other crafty things in my life. Every Monday I knit with a lovely group of women at Ingebretsen’s. 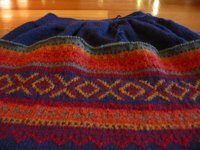 One of the knitters has been working on a Scandinavian ski sweater for a year or more. She finally blocked the pieces and is ready for the construction part. 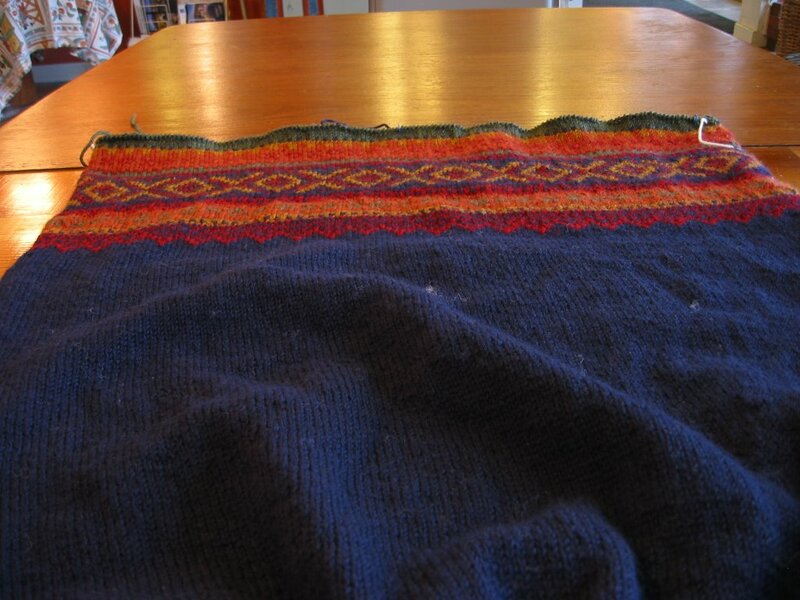 I’ve never seen the process of steeking before. This week she will pull out the sewing machine and scissors and attack this. 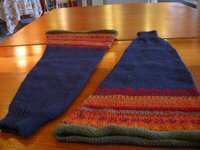 Two beautiful sleeves – actually the same size (the camera distorted them a bit) will be sewn into this body. She’s already marked the arm holes with white yarn. Those will be stitched up then cut and then the sleeves will be sewn in. Then the same process of locking the stitches, cutting and then sewing will happen around the collar. I’ll be sure to post a finished picture when it’s all finished! I can’t wait to try this. I’m thinking I’d like to start on a smaller sweater (read child size) and work my way up to a cardigan (for me!). The ladies at Ingebretsen’s are inspiring, especially when it comes to color work! In my own small way I’m taking baby steps in color work. 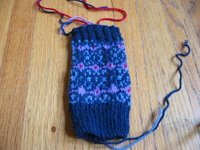 Here are the wrist warmers / pulse warmers for someone on my Xmas list. 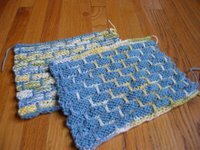 They are knit with Dale Baby Ull – awesome yarn!As you can see there’s ends to weave, some duplicate stitching to do, and a wee bit o’ blocking. Oh and I still need to make the other one. 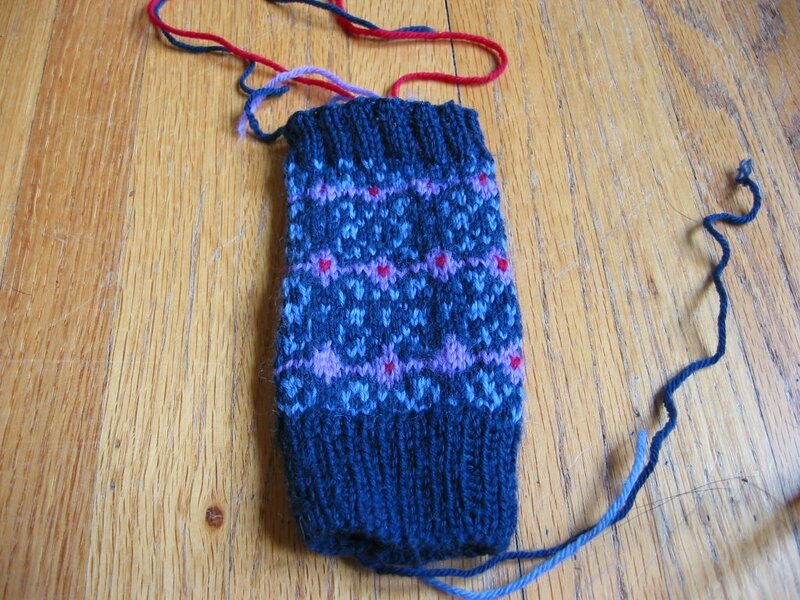 I keep hoping I’ll eventually have an amputee on my gift list to knit for. No luck. 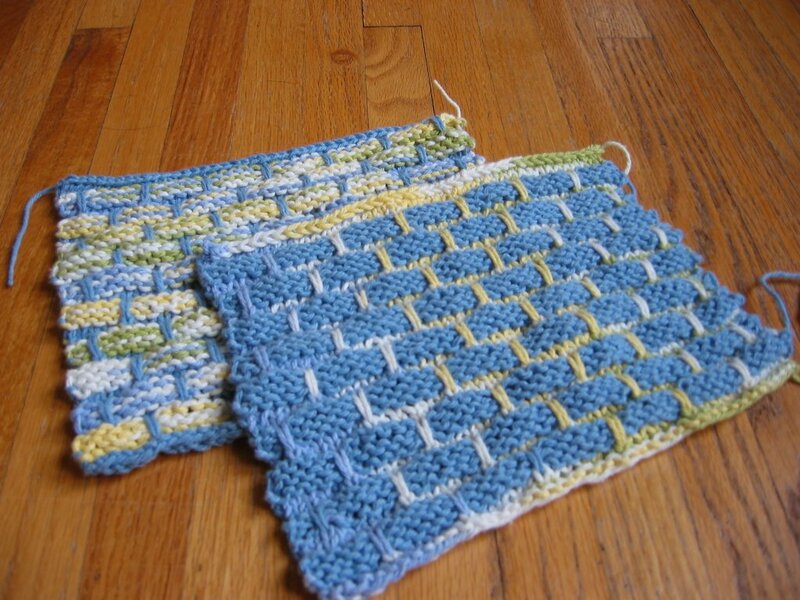 Finally, I must give some time to the ever present ball band dishcloth which has been a boon to my zombie knitting. I whipped two out last Saturday while Joe drove us around the Rochester area. I have an addiction and I think it’s safe to say it’s a useful one. If you are on my list – you’ll probably be getting one (or more) of these. I love mind numbing knitting! This entry was posted in Uncategorized on November 29, 2006 by Jennie. Just checked out your website and it’s great. If I didn’t already have a mug tree full of sheepy mugs I would start ordering!